Nisemonogatari follows on from the events of Bakemonogatari, which followed the misadventures of Koyomi Araragi as he meets people touched by the supernatural. Nisemonogatari revolves around the supernatural events relating two his two younger sisters, Karen and Tsukihi. Tsukihi unlike her siblings she prefers indoor activities. She is short-tempered and often changes her hair style. 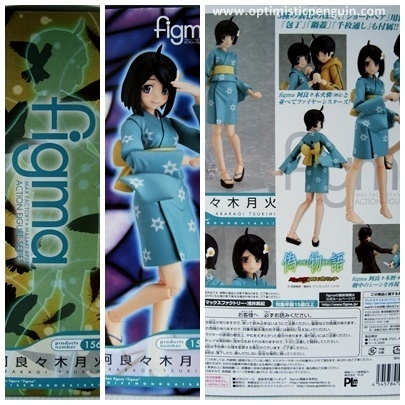 Tsukihi comes in a standard figma box. Inside the box the figure is held between two pieces of moulded plastic, with spaces for their accessories. The extra hands and the base of the Figma stand are stored in plastic bags underneath the figure in the plastic moulding. Figures are usually wrapped with plastic in certain areas to protect the paint. Boxes also come with inserts which act as backdrops in the box and can be taken out and used for backdrops while displaying figures. Tsukihi's backdrop is pink with shadows of crows on it. Tsukihi also comes with a special cut-out to use with the Di: Stage. Figmas also are supplied with a small zip-lock bag to store all the accessories in, the name of the figure can be written on this bag so that figure accessories can be stored neatly. figmas also come with a neat little device for storing the extra hands in. 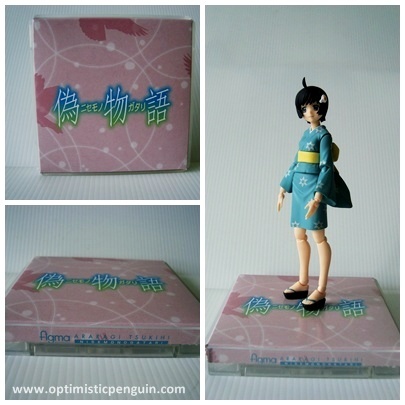 Tsukihi comes with the standard figma stand. 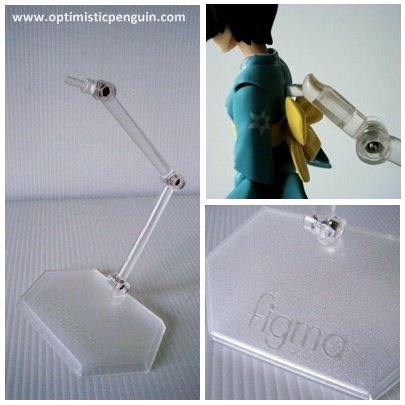 Made of clear plastic it has three points of articulation which move forwards and back on hinge joints, one joint is at the bottom where it plugs into the base, one in the middle and one where it plugs into the figma. The articulation of the stand allows the Figma to be posed in a variety of dynamic poses, and because it is clear it does not interfere with the aesthetic of taking dynamic and exciting photos. Tsukihi also comes with an extra L shaped piece which attaches to the end of her stand so that she can be attached to her stand in spite of her long hair. A very nice touch by Max Factory. Tsukihi's overall design is cute with her short summer yukata and fried egg hair clip. Starting from the top her hair is nicely sculpted hugging her face. The body of her yukata is made of soft PVC with ripples and folds in the fabric giving it a sense of movement. The sleeves are hard plastic and also look great except for in a few poses where they can look a little unreal. Her obi is tied in a standard bow and has good creasing and with the split at the back and sectioned front of her skirt she can move her legs freely. Her feet are cute and she looks great in her geta. 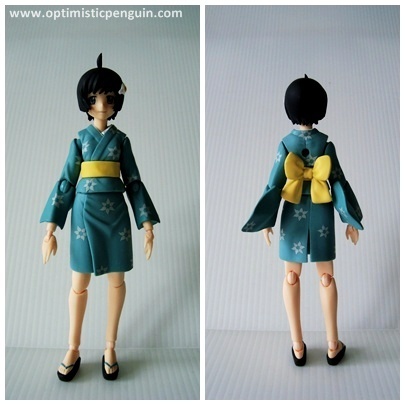 Tsukihi has a colour scheme of blue and yellow. She doesn't feature any shading but the pattern on her yukata is spot on with no mess ups and the same with her hair clip. And as usual her face is perfection. 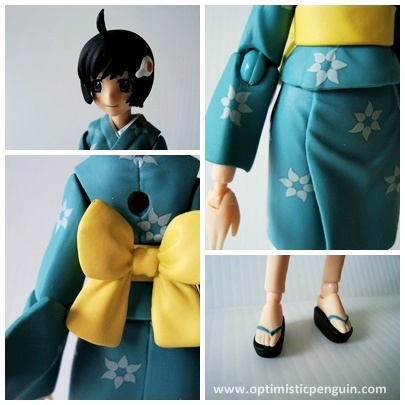 Tsukihi's accessories are simply painted but nice and her extra faces look great with lovely rosy cheeks. 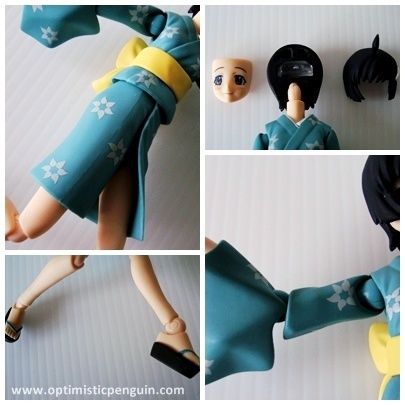 Tsukihi use’s the standard figma joint system. figma joints are hinge joints with pegs on either end allowing both forward and back movement and rotation. At her neck is a figma joint which allows the figure to look side to side, down and up. 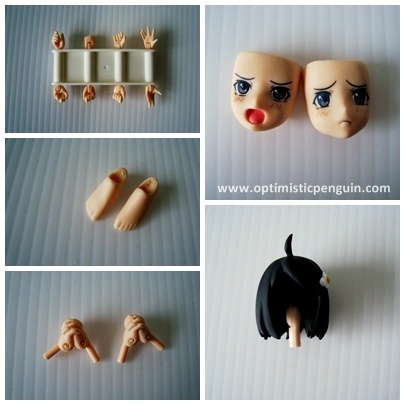 To change the faces on figmas the front piece of hair is removed and then the faces can be taken of and swapped. 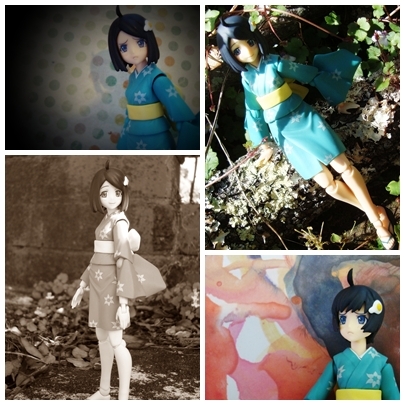 Tsukihi is therefore highly posable and can be posed in a variety of ways. 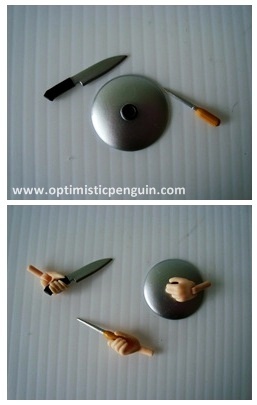 With the use of the accessories supplied, her pan lid and kitchen knife, letter opener, sad and angry faces, and her clasped hands, she can be displayed in a number of poses, she can be threatening to strike with her kitchen utensils, defending her self with a letter opener, or clasping hands with her sister, although I don't have that figma so she had to make a new friend. However there are a few areas in which articulation is restricted although the lower part of her yukata is flexible it can be difficult to hold wide leg or lifted knee poses. Tsukihi comes with three facial expressions; her happy face, a shouting face, and a sad or worried face. Tsukihi also comes with an assortment of hands; a pair of open hands, a pair of relaxed hands, a pair of fists, a pair of hands for holding items, and two special hands one for holding her pan lid and another for holding the knife and letter opener, and finally a pair of hands clasping. Tsukihi also comes with a kitchen knife, a letter opener, a pan lid, and an alternative head piece with her hair a bit longer and straight. Tsukihi is fairly compatible with other figma accessories and her holding hands can hold most figma items. So she can wield a sword with the best of them, her body also lends its self well to head swapping and you can dress all your figures up in a festive yukata. Next up is a height comparison, as you can see she is on the shorter side of the figma height scale but fits in well with the others. In general Tsukihi is a great figure as she holds a lot of play value as she is a versatile swaper her clothing and accessories lending themselves to other figures. I recommend for any fan of the Nisemonogatari series or a figure collector who has a soft spot for traditional japan dress. Overall I am well pleased with Tsukihi and she is a great addition to my figure family. That is an awl, not a letter opener.